September 16, 2018, Rotterdam, the Netherlands – This morning the high blue skies were laced with dispersing vapour trails as His Holiness the Dalai Lama drove to the Ahoy convention centre. In the first hall more than 5000 Tibetans from the Netherlands, Belgium, Britain, Spain and Austria had gathered to listen to him. He waved to them from the stage before taking his seat. Meanwhile, a delightful group of young Tibetan children sang a prayer for his long life. “We’ve been in exile almost sixty years,” His Holiness began, “and some of you here are in a second exile. In our homeland, our own people and culture are on the verge of extinction. Historically we’ve faced all kinds of ups and downs, but now we’re at a crucial juncture where the very Tibetan identity is under threat. Tibetans are blessed by Avalokiteshvara and we are a naturally compassionate people. “Songtsen Gampo initiated the formulation of a Tibetan literary language based on the letters, vowels and consonants of Indian Devanagari and Shantarakshita encouraged the translation of Indian Buddhist literature into it. During Trisong Detsen’s reign, Buddhism was established on Tibetan soil. Today, Buddhism is in decline while a wider interest in it is growing. Our spirit is undimmed, despite the deaths of thousands. In order that all sentient beings have bliss. “Only a Tibetan would make such a prayer. Whatever oppression the Chinese have applied, they have been unable to crush the Tibetan spirit. Even young children sent to a school in Shanghai where they were forbidden to speak their native language proudly assert that they are Tibetan. Similarly, Phuntsok Wangyal and others were committed to the Communist ideal, but that didn’t diminish their sense of being Tibetan. “At a time when we left Tibet with no friends, Pandit Nehru in India gave us great help. He supported the setting up of English medium Tibetan schools where our children could also learn Tibetan. He supported the reestablishment of the great Monastic Seats of Learning, Sera, Drepung and Ganden and eventually Namdroling. We can be proud of the knowledge we have kept alive. His Holiness recalled appealing in vain to the UN and Nehru’s advice that nothing would come of it. Since 1974, he said, Tibetans have no longer sought independence but aimed to achieve the rights and privileges mentioned in the Chinese constitution. The Middle Way Approach grew from this. The Tibetan Community in the Netherlands presented His Holiness with elaborate silver Dharma Wheel as token of gratitude for his qualities of body, speech and mind. They expressed the wish that his aspirations be fulfilled. His Holiness responded that he would pray for their well-being in life after life. 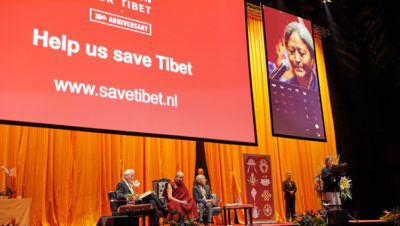 In another hall in the complex a capacity crowd of 12,000 were assembled for an event organized by the International Campaign for Tibet (ICT) to honour its 30th anniversary. Executive Director Tsering Jhampa introduced the occasion. ICT, she told His Holiness, was founded 30 years ago to fulfil his vision. It has grown from the original office in Washington to having offices in Brussels, Amsterdam and Berlin and a field office in Dharamsala. ICT works to keep the Tibetan cause alive while aiming for a negotiated solution. She added that there is a need to find new ways to tell Tibet’s story and build stronger support amongst like-minded individuals and organizations. Richard Gere recalled His Holiness telling him in Bodhgaya in 1986 that Tibetans needed a lot of help. He asked if he could remember what he’d had in mind in relation to what was happening in Tibet. His Holiness reached back to the open revolt that broke out in eastern Tibet in 1956. This spread to Amdo in 1958 as a result of which many were killed. In the 1980s fact-finding delegations went into Tibet and reported villages and communities where the male population had been drastically reduced. After the Cultural Revolution, when Hu Yaobang was Party Secretary, the situation eased in Tibet. It was followed by the Tiananmen incident and a renewed crackdown. During the time of Jiang Zemin, direct contacts were renewed again. Richard Gere and His Holiness discussed the great positive effect Nalanda University had had on Tibet, which had contributed to His Holiness and other Tibetan scholars being able to engage in mutually fruitful dialogue with modern scientists over recent decades. The Mind & Life Institute has grown out of these interactions and has contributed to greater awareness of neuroplasticity, which indicates that factors such as changes in consciousness can affect the brain. Richard Gere concluded his conversation with His Holiness by making an appeal to the audience, “Please remember the people of Tibet and look into how you can help them.” Matteo Mecacci, President of ICT stepped forward to announce that ICT would offer a financial grant as a commemorative gift of gratitude to His Holiness to be made available to the Dalai Lama Institute for Higher Education. A certificate denoting this offer mounted like a thangka painting was presented to His Holiness. In bringing the ICT event to a close, Christa Meindersma observed that ICT attempts to reveal what’s happening in Tibet and called on others to do their part to protect the country’s language and beautiful culture. “The material development we can see in the USA and Europe is wonderful, but it brings no guarantee that people who experience it are happy. Indeed they struggle with stress, greed, jealousy and extreme competitiveness. Recent evidence that basic human nature is compassionate is a source of hope; however it also suggests that the existing education system with its materialistic goals is inadequate. Greater attention needs to be paid to inner values. “We need to learn how to tackle our destructive emotions, not through prayer but by employing reason. Since we all depend on the rest of the community, warm-heartedness is essential. We need to examine how anger provokes problems and understand how one of the principal remedies, loving-kindness is a reflection of basic human nature. Among the several questions from the audience His Holiness answered, he touched on the importance that coming to understand emptiness and altruism, as described in Shantideva’s ‘Guide to the Bodhisattva’s Way of Life’, had been in tackling his own emotions. He agreed with a questioner that while he has great admiration for the Jewish people, who he sees as an able people, relations between Palestinians and Israelis are very sad. He suggested that the custom of recognising reincarnations can sometimes involve vested interests. Asked what advice he has for taking care of young children, he replied that he had none so had no experience. However, he confirmed that what is most important is for parents to provide their children with as much love as they can. He clarified his view that it is wonderful that European countries have given shelter to refugees from other countries. These people have fled violence and killing in their homelands. Ultimately, those countries remain their home and eventually, when peace is restored, they may want to return to rebuild their societies there. For that reason it will be good if their European hosts can educate and train children and young people to equip them for that rebuilding. A woman in distress requested His Holiness’s blessings to help her and her family heal and recover from damage as a result of associating with the practice of Shukden or Dolgyal. His Holiness told her, “Yes, I’ll pray for you. I did this practice myself until I understood it was improper. 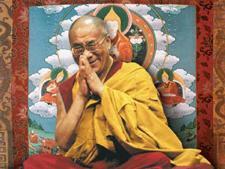 The 5th Dalai Lama recognised how destructive the practice could be. Shukden worshippers were not allowed to practice Nyingma or Kagyu teachings, so I restricted the practice to protect religious harmony in Tibetan monasteries. Paula de Wijs, chair of the Dalai Lama Foundation offered words of thanks. Waving to the audience on the way, His Holiness left the stage, posed for photographs with volunteers and climbed into a car to return to his hotel. Tomorrow, back at the Ahoy, His Holiness will teach the ‘Eight Verses for Training the Mind’. Recent reporting of His Holiness the Dalai Lama’s views on refugees has been taken out of context. Kindly see His Holiness’s response to a question about refugees during his public talk in Rotterdam, the Netherlands, on 16 September 2018. “When refugees from other countries have come to Europe, it’s wonderful that Germany and other European countries have given them help. However, I think that most of those refugees think of their own lands as home, but just now there is lots of killing, bullying and suffering there. That’s why they escaped. So, in the short term, European countries should provide them with shelter, and should particularly provide children with facilities for education and training, including mechanical training, for the young people. The aim is that they should eventually be able to return to rebuild their own countries. That has been my view right from the beginning. Video of the question and His Holiness’s answer can be viewed a here https://www.youtube.com/watch?v=d7ERut3AtJg&feature=youtu.be.